All 28 highlights articles are available in the print version. Advocates of intelligent design theory bring their message to Congress. A magnitude-7.5 earthquake hits Indonesia while the Kavachi seamount builds an island in the Pacific Ocean. 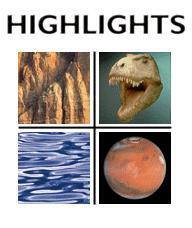 Top left: Geotimes file photo. Top right, a fleshed-out model of the skull of the Tyrannosaurus rex Sue, on display at the Chicago Field Museum of Natural History. Bottom left: Geotimes file photo. Bottom right: Mars, as seen by the Hubble Space Telescope (NASA).